The bends of the Mamore River in Bolivia. Credit: Planet Labs, Inc. The research was led by the UT Jackson School of Geosciences Bureau of Economic Geology and found that the rate of river migration is directly linked to how sharp its bends are—a finding that challenges the prevailing wisdom on how river curvature and migration relate and shows that the relationship is not as complicated as previously thought, said Zoltán Sylvester, a research scientist at the bureau who led the study. It is established science that the rate of river migration—how quickly parts of a river move across a landscape—is driven by the curvature of its bends. However, earlier research found that there was a cap on how much curvature could influence migration rate. According to these earlier findings, the maximum migration rate occurred along parts of the river where the radius of curvature of the bend (a value that relates to bend sharpness) is two to three times the width of a river. Curves sharper than that were thought to slow migration down by creating a more turbulent environment for water to flow through. 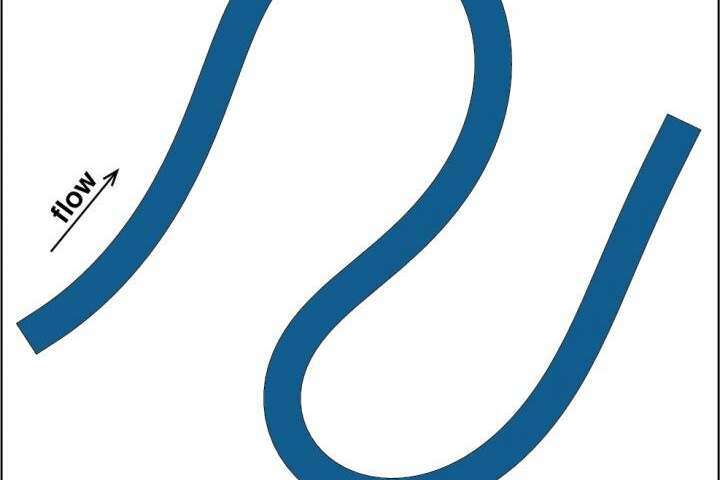 A cartoon animation showing the relationship between river bend curves and river migration. While sharp bends cause higher rates of migration, the point of maximum migration occurs downstream from the maximum curvature of the bend. This creates a 'lag' between the point of maximum curvature and the point of maximum migration. Credit: Zoltan Sylvester/ The University of Texas at Austin Bureau of Economic Geology. In contrast, Sylvester and his team found that there is no cap. Instead, there appears to be a direct connection between river bend curvature and migration rate, with sharper bends causing a higher erosion rate—which is linked to a faster rate of migration. Another key finding is that the migration linked with the curvature occurs downstream from the bend itself—not exactly alongside as it was previously often considered. 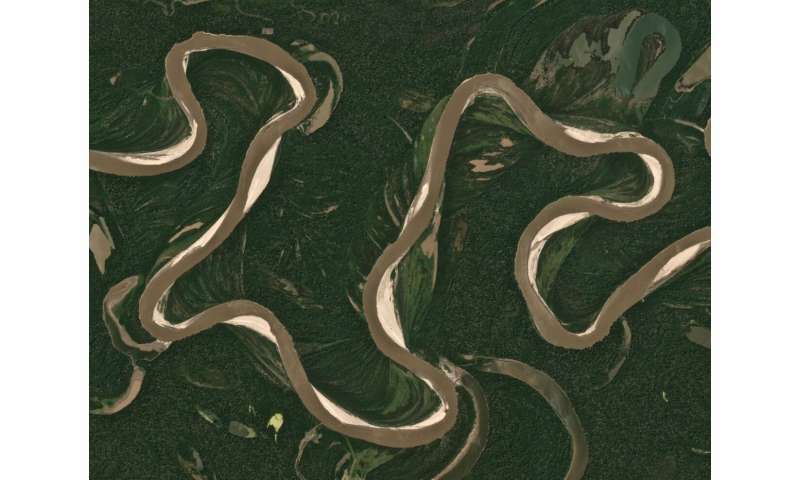 The researchers used satellite data acquired by the Landsat program to reveal the connection between river bends and migration, with the images giving the researchers a bird's-eye view of hundreds of river bends along seven rivers in the Amazon Basin and how they migrated over the past 30 years. The researchers chose to focus on the rivers in the Amazon Basin because of their high migration rate and their location away from the interference of people or complicated geological settings. These other factors can influence the rate of river migration—but having a baseline idea of how the curvatures help control a river is a useful starting point and could help reveal when other factors are at play, said Jonathan Schwenk, a postdoctoral fellow at Los Alamos National Lab who studies river behavior. This is hydrologically obvious if one thinks about it. The sharp bends present an obstruction to the inertia of the water and are therefore eroded. Eventually the water pushes through and the bend is cut off. Perhaps I am oversimplifying, but to my mind this is the most powerful mechanism. During flooding, the normal behavior of the river is enhanced and the meandering course can be ignored. Once that happens the river will never be the same. Sandbars, newly eroded banks, and many other changes leave the river different from the pre-flood self. In Glen Nevis, where we often holidayed, other than portions in 'gorges', the upper and lower portions of River Nevis meandered enthusiastically within the flood-plain, to extent that erosion threatens low-lying sections of the lane.